So for some my blog may seem to be misnamed as there really hasn’t been much sea action recently. That was until I was informed that I was going to help rig a safety system for going aloft on the “bounty” (the replica used in the film). That was of course after my crazy week in the luk wu gorge in the eastern new territories. All in all Asia pacific Adventure is as ever keeping me on my toes as the rigging of the safety sytem quickly became organising a staff day on the ship and that meant learning the rigging. The bounty is a fully rigged ship which means she has 3 masts with square sails plus staysails (jibs to the dinghy sailors out there) and a mizzen. Luckily for me she only currently flies 11 sails but unluckily the bigger of the square sails can have up to 12 lines to control them (braces, clewlines, buntlines, leechlines, tacks, sheets etc). A day and a half after first seeing the ship I was trying to explain tall ship sailing to 20 of the APA staff. There was definitely some confusion as the permanent crew dont speak english and my cantonese sailing terminology stops at “li seng” (pull rope). Anyway heres some photos of the sea at last, with more to come as I have a whole week on the Bounty in November. 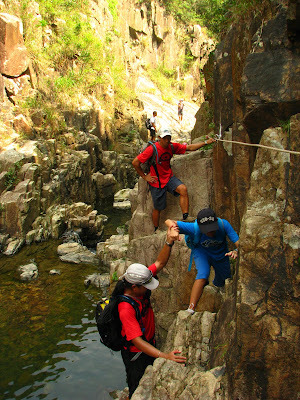 Bani and B help a student on the traverse in the Gorge. 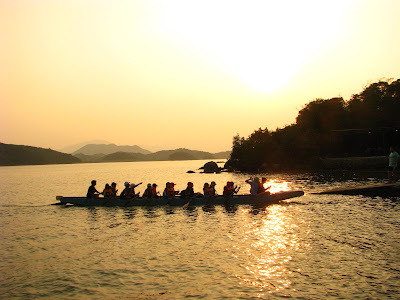 One of the groups arrive back at camp by dragon boat after a day in the gorge Lamma island from the south end. Far left is the power station, yung shue wan is beyond that while the buildings on the left of the picture are Aberdeen (south side of HK island) Geordie on a fast learning curve – first time on a tall ship and rigging safety lines all over the place. (taken on the fore course yard) Another bit of wisdom from the Hong Kong ferry service “So if you just pull this one…” Trying to work out whats what (its a fore topsail buntline) (Courtesy of Becca) Becca teaches Captain Lau (in the grey boiler suit) how to sail. Victoria Harbour evening light. One week at home after three years was not enough, but great to see family and a small piece of scotland. Now back in Hong Kong till christmas time with hopefully a couple of side trips into china. I was sitting on the MTR (the tube) yesterday morning and caught the old woman next to me trying not to let me see her staring at me. It was early, I was tired but also intrigued. Finally I thought I had worked out what she was staring at. I leaned across and said in my best chinese accent “mao mo”(body hair), she stared at me in shock and then burst out laughing. I then tryed explaining that it was hot(being hairy) but my cantonese failed me. Coming back to hong kong has been pretty crazy, the mad bustle of the city to the lush green of the new territorries. 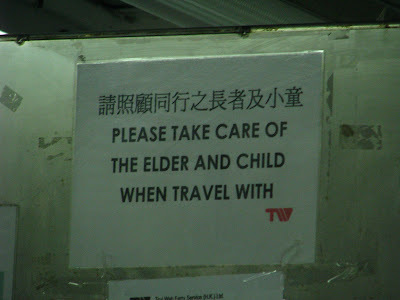 I find I can remember bits of cantonese which helps a little. We have just finished the staff induction week which was long and not too easy for me, fighting to remember hong kong and to swap companies. 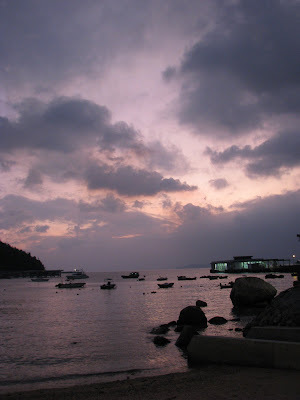 Now I have a day off chilling in Yung shue wan the village i am living in on Lamma island, a haven of no cars away from the bustle of the city just a half hour ferry ride away. Food in hong kong is always interesting, the choice of paying a bit more for something that should be recognizable or for blindly ordering in a cheaper place. The variety of food is staggering and I am finding it hard on my walk through the village in the morning not to at least pick something up. Really this is my first time as a proper commuter and even the little things like actually making coffee myself instead of buying it on the way is throwing me. Waiting for the bus – another long day of staff training.